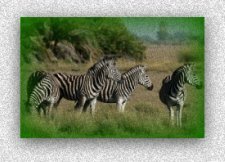 The Okavango Delta is Botswana's most famous and popular tourist attraction. It is a unique wetland system that spreads through the Kalahari Desert and is the largest inland delta in the world. The delta is a place of extraordinary beauty and exceptional diversity of wildlife. 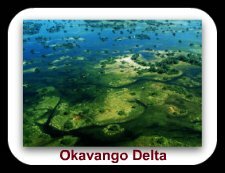 The source of the Okavango Delta is the Okavango River that enters Botswana at Mohembo near Shakawe. The Okavango River connects to the Kavango River from Angola which enters Botswana through Namibia. The mass of waters from the river does not proceed anywhere else beyond the borders of Botswana. 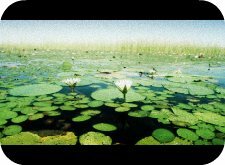 Instead it spreads on much of the north western terrain of Botswana to form the Okavango Delta. The delta then creates a unique eco-system that supports land and water animals, vegetation and inhabitants of the area. During the winters - between May and August - the tide of the river rises and sends aggressive waters into the delta and creates flooding. The major settlements in the area are always affected resulting in people being moved to high lands away from the flooding delta. The Okavango Delta was nominated the best tourist spot in the world for 2010 by the World Travel and Tourism Council. The award, which have been awarded annually since 2003 by WTTC, served to recognize sustainable tourism development in the Okavango Delta. Mainly, the award recognized the tourism development programs of the delta that help improve the livelihoods of communities while supporting the protection of natural and cultural heritage. The Okavango Delta is a major source of food for the communities around the area. Fishing is carried out daily with the haul taken to local fish markets for selling or consumed in households. 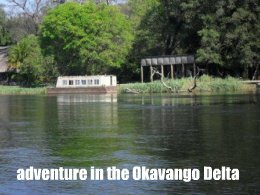 Various safaris take place in the Okavango ranging from boating safaris and cruise, and guided mokoro (dugout canoe) tours. You can take game drives as well as watch the captivating sun as it rises and sets. 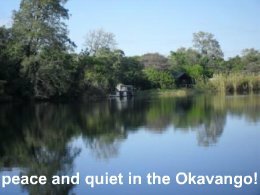 Hotel accommodation in and around the Okavango Delta adds to the splendor of the area with exquisite lodges and tented campsite. A number of these can be found in the recesses of the Okavango, well away from the world's 'noise' while one enjoys the best of nature.